Have you met people, at one time or another, who claim or assert that they are not afraid of anybody and you have come to know that truly, they are fearless people! Good! But permit me to let you know that these same people have surreptitious fears clawing at them from inside. Types of Phobias (with List and Meanings) will certainly confirm to you that my observation is true! Mind you too, I am sure there are things you are (secretly) afraid of with all your brain and brawn! Do well to check out your phobia and share this post with your friends and circle of influence globally for them to check out if they have any phobias too. Maybe you can then begin a quest to confronting your own phobias! Do well to note that most words that appear grandiloquent can be broken down into smaller bits for easy understanding. Study the etymology of these ‘phobic’ words and you will easily arrive at their meanings. For instance, the prefix, ‘odonto–’ has to do with ‘teeth’ or ‘dentition’. So we have words like: odontiasis, odontalgia, odontocete, odontology, etc. 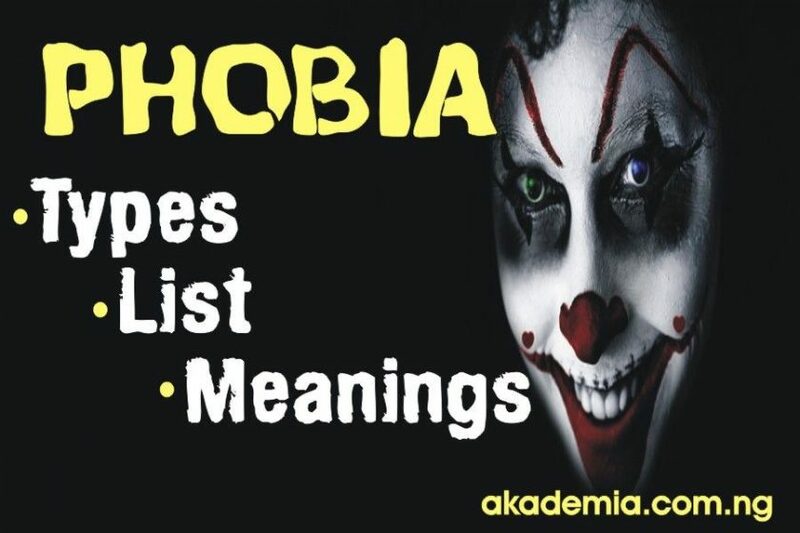 So as you go through these phobias, ensure you take note of their etymology to widen your knowledge base! Encarta Dictionary describes phobia thus: ‘an intense and persistent fear of a specific object, situation, or activity. It is also an irrational or very powerful fear and dislike of something such as spiders or confined spaces. It is from the Greek word, ‘phobos’ which means ‘fear’. Psychiatrists recognize three major types of phobias. Fears of specific objects or situations such as animals, closed spaces, and heights. This may begin in childhood and continue till adulthood. Fear of open, public places and situations (such as public vehicles and crowded shopping centres) from which escape is difficult; agoraphobics tend to avoid more situations until eventually, they become housebound. This usually begins in late adolescence. Fears of appearing stupid or shameful in social situations. This is also associated with adolescence. Contamination and germs – Mysophobia (also verminophobia, germophobia, germaphobia, bacillophobia and bacteriophobia). The term was coined by William A. Hammond in 1879 when describing a case of obsessive-compulsive disorder (OCD) exhibited in repeatedly washing one’s hands. We have seen a long list of different types of intense and persistent fear of a specific objects, situations or activities which we call Phobias. Psychiatrists also call them Phobic anxieties characterized by physiological symptoms such as a rapid, pounding heartbeat, stomach disorders, nausea, diarrhoea, frequent urination, choking feelings, flushing of the face, perspiration, tremulousness, faintness and many other symptoms. A phobic person often leads a constricted life. Phobic anxiety is distinguishable from other forms of anxiety only in that it occurs specifically in relation to a certain object or situation. This anxiety is naturally exaggerated compared to the real situation. The phobic individuals know that the fear they entertain is purely irrational and sometimes ridiculous. I have known my own phobia. This is a wonderful teaching.